International Trade Secretary Liam Fox has reignited the row over chlorinated chicken today, saying he has ‘no objection’ to it being sold to the British public. In July, Defra Secretary Michael Gove had to step in to reassure farmers UK standards ‘would not be diluted’ after Dr Fox said any meaningful trade deal with America would have to include agriculture. But giving evidence to the International Trade Committee this morning, Dr Fox appeared to suggest chlorinated chicken would actually be preferable to non-chlorinated chicken. 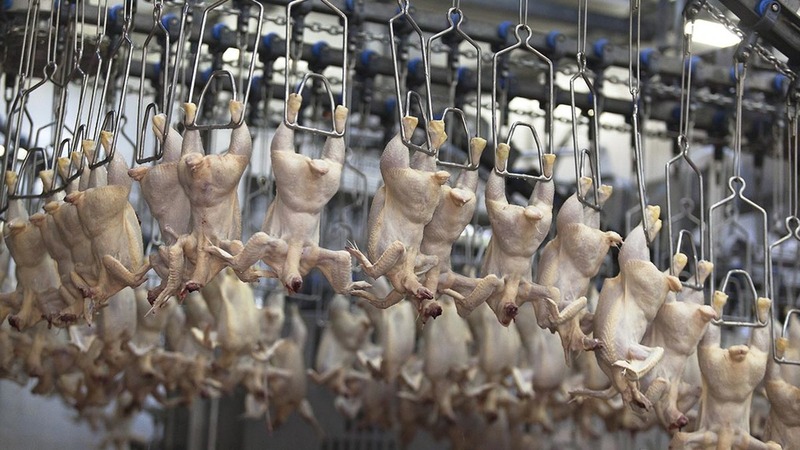 He said: “There are no health reasons why you could not eat chicken which had been washed in chlorinated water. Most of the salads in our supermarkets are rinsed in chlorinated water. Asked if he would like to see British consumers eating chlorinated chicken, Dr Fox replied: “I have no objection to the British public being sold anything which is safe as long as they know what they are eating. He also told MPs on the committee Brits should not avoiding eating chicken when they visit America. Farming Minister George Eustice has previously hinted that a decision on whether chlorinated chicken should be allowed on British shelves would ultimately be down to the consumer, but just last month, Mr Gove promised wrangling over the issue would stop a US-UK trade deal in its tracks. Speaking to the Environment, Food and Rural Affairs Select Committee, he said: “One of the things the cabinet has agreed, and we had this discussion, is we cannot compromise high environmental or high animal welfare standards in the pursuit of a trade deal. “In a way, it would be harmful for us to do so. Not just harmful in environmental terms, but harmful also because if we think about British produce, we compete and we sell on the basis of quality and provenance. “If we were to undermine the high reputation British agriculture has earned by seeming to compromise on those standards, then we would be tarnishing the brand. Shadow Defra Secretary Sue Hayman has weighed in on Dr Fox’s latest comments, accusing the Government of giving mixed messages.